Don’t Even Think About Doing These Things to Clean Your Carpet! Clean carpet is the foundation of a healthy home, both literally and figuratively. While maintaining your carpet doesn’t have to be complicated, there are definitely some things you should know before you take the DIY approach. With so much information out there on what you should be doing to your carpet, here are some common things that you should never, never do. Using too much cleaner, whether natural or chemical, on your carpet can have disastrous effects. 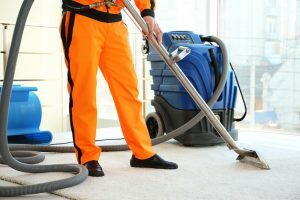 Because most carpet cleaners are water based, using excess cleaner can saturate your carpet fibers and result in mildew or simply leave a greasy residue. Less is definitely more. To help, always put your cleaner in a spray bottle first to achieve a misting, rather than a soaking effect. We know, vacuuming is a chore. But not vacuuming can actually shorten the lifespan of your carpet. Tracked-in dirt will stain your carpet and cause it to smell. Just because you can’t see, it doesn’t mean it’s not there, so definitely vacuum at least once a week. That spilled glass of wine, the toast that fell buttered-side-down, your pet’s accident; whatever you do, don’t let them sit on your carpet for too long. Stains that are left sitting become a lot harder to remove. If you can tackle stains right away, most of the time they can be addressed with simple at-home remedies, without having to resort to industrial cleaners. Think about it: those cleaning agents you’re using on your carpet are going to linger in your room. The chemicals will stay in the air and, consequently, in the oxygen you and your family breathes. Be very cautious when it comes to harsh cleaners and try to use at-home remedies first, such as baking soda, vinegar, or essential oils. Also, always make sure you test the chemical cleaner in a hidden area before you spread it to your entire carpet. Choosing a different cleaner is a lot less expensive than replacing your carpet! At the end of the day, you’re the one responsible for maintaining your home, but a big part of responsibility is knowing when to step back and let a specialist handle the job. Your carpet should receive a professional cleaning at least once a year, depending on the traffic it gets. Professional cleaners have access to cleansing formulas and tools that can give your carpet a deep cleaning. Furthermore, professionals are professionals for a reason. They’ve been trained for what they do, and they know how to get the job done right. 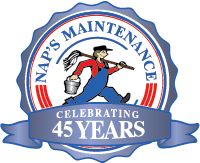 We here at Naps Maintenance Service have earned a reputation for high-quality residential & commercial cleaning service. For more than 45 years, we have been servicing the areas of Massachusetts and Rhode Island in residential, commercial, and industrial settings. We take a community-based approach to service, and treat all our clients like family. Not only will we give your carpet a second-to-none cleaning, but we will also offer you tips on how to maintain it for years to come. Give us a call today!